I’ve no idea about Korean food, but Ken Hom says these are Korean style so I’ll take him at his word. Either way, these tender kebabs are divine, and should you have the ingredients to hand (I had to shop for the mirin and the spring onions) are a snap to make. I couldn’t taste the pineapple juice in them, but I think it does add to the underlying sweetness and apparently helps tenderize the meat. Chop the steak into chunks roughly 1 inch x 2 inches. Mix the rest of the ingredients together and pour on top of the steaks in a non-metallic bowl. Leave to marinade for about an hour at room temperature. Thread onto kebab sticks (either metal or if using bamboo, soak them in cold water for 30 minutes prior to using) and preheat your grill. 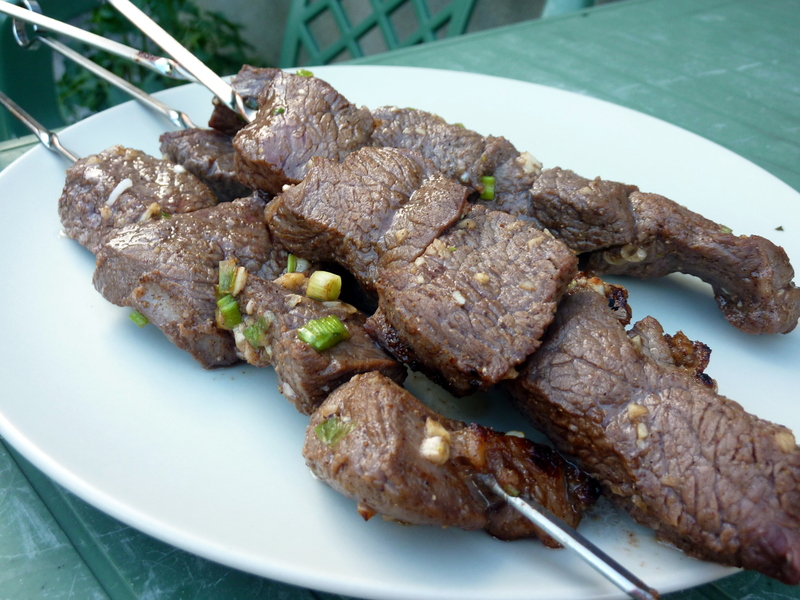 When your grill is hot, put the kebabs in and cook for 3 or 4 minutes on each side. 동. 즐기다, 즐겁게 시간을 보내다.